The texture and color of these curtains is gorgeous! The material is very high quality and have a heavy and durable weight to them. I love that they come in ac set of 2! No need to order single panels for one window. The blackout curtains are helpful in retaining less heat in the Room and completely darken it for sleeping and night. 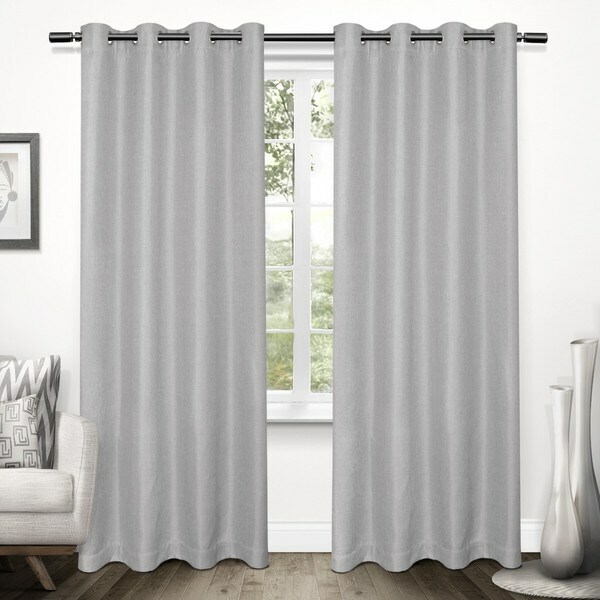 Insulate your home and save energy with these Karins Tweed Textured Linen Blackout Curtain Panel Pair by Carson Carrington. Featuring Termax technology, these curtains help regulate the temperature in your home while adding a calming beach aesthetic to the room. They aren't the *** panels. These are more light filtering than blackout. They still work well enough when paired with light filtering sheers. They are lightweight and may require being ironed and starched to hang right for you. No real blackout, very bright fabric I needed to use another one behind to prevent the light from coming into the room. The perfect black out drapes that are high quality fabric and actually black out the light! Very thin material. Poorly sewn, uneven hemline....and I was sent the wrong color by Overstock. "Is the white color a true white or is it a vanilla/off-white? It appears to be a true white (like white paper), which is what I want, but the name, winter white, is usually associated with a yellowish white, at least in clothes. Thank you." Is width measurement of 52 combined for both panels or each panel?